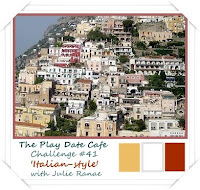 Thanks so much for stopping for this weeks Play Date Cafe color story. 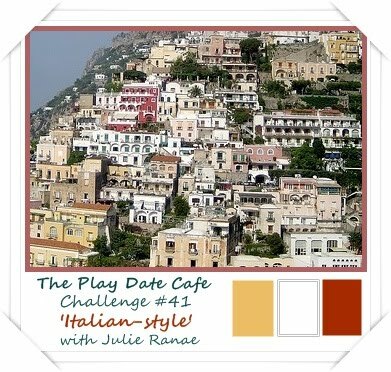 This week on her travels, Julie is headed to Italy, and has pulled colors for you to work with. I've used So Saffron, White (my doodles - click to enlarge), and Cherry Cobbler. I stamped the Keys and sentiment from the July Unity Stampin' Store Kit - Key to Joy and The Right Words, (note this kit is sold only in stores), in Black Archival on Saffron card stock, and added part of the stitching image around the sides. 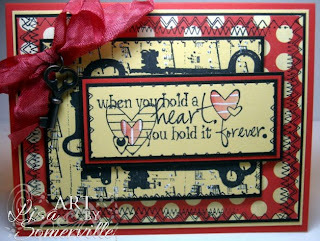 To stay with Julie's color story, I used a White Gel Pen to add some doodles to both stamped panels. I also added the stitching to the Cosmo Cricket panel. Here's this weeks Color Story Photo,we'd love for you to play along with this weeks challenge at The Play Date Cafe, you can find all the details here on how to enter. If you upload to any online gallery please use keyword PDCC#41 so we can find your creations! a beautifully detailed and designed card!!! Love your card! The pattern paper is beautiful. The sentiment is perfect with your key background. Beautiful card. Luv it Lisa! Sure made me smile first thing this a.m., it's a "happy" place! Wonderful use of the challenge colors! Just love the heart sentiment! Beautiful!! Lisa, this is a beautiful card - you've used those colours so well. A hard act to follow! LOVE this Lisa, what fab colours for the challenge! This is beautiful! I have lost my mojo this week! Searching for some! Your team always does such a fantastic job! very cool card, love that stamp set! Love your card and the stitching, love the colors for this challenge. Love these challenge colors and your card is very pretty! Your DP is really perfect for this challenge. Beautiful job as always. Oh LIsa---this is BEAUTIFUL! You really made that red come alive with the pops of yellow;) Beautifully done! LOVE being on the same team as you!! SUPER talented:) Love it! Love your card, color choices, layout and the sentiment, awesome card.